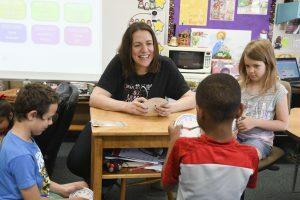 After 18 years as an educator, Michigan’s newest Teacher of the Year is guided by a big-picture view of her role encompassed in three priorities. 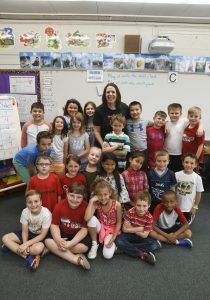 “We’ve got to keep the big things big,” said Laura Chang, a second grade teacher at Sunset Lake Elementary School in Vicksburg, who assumed the state’s top teacher mantle in May. Her first priority is to create kind, contributing members of the community who know how to lead and collaborate. The class sets academic and behavioral goals and monitors progress, “and if we fall short, we examine that as a group,” she said. The Sunset Lake staff just finished the second year of implementing the “Leader in Me” model, based on the work of Stephen Covey in his best-selling book, The Seven Habits of Highly Effective People. The initiative aims to equip students as 21st-Century leaders. Five years ago, Sunset Lake was labeled a “Focus School” by the state, one step above the most struggling “priority” status. Three years of work in shifting the school’s culture and getting everyone pulling in the same direction has paid off with improved student achievement. Chang plays an integral role on the team leading change in the building, and she works as the district’s technology integration leader, but most importantly she inspires others as a joyful educator who “serves from the heart,” according to Principal Amie McCaw.